Once again it’s time for the madness of March to begin! Which teams have the best shot of going to the final four? Is there a team that might become this year’s Florida Gulf Coast? And do any of the 16 seeds have a realistic shot of beating a 1 seed? Well sit back, because we’re going to answer all of that and more! Somebody tell Cinderella to get her glass slippers, it’s time to go dancing! Before we get to the bracket, we need to decide on which ranking system to use. Because we want to use these rankings for predicting future outcomes, we want a system that uses scoring margin to rank the teams since it is the best predictor of future performance. So anything that focuses on wins/losses are out (sorry RPI and BPI). Last year I tracked 4 different ranking systems, and the Sagarin Predictor came out on top. I did a similar analysis this year using the Pomeroy Ratings, two different Sagarin score based rankings (golden mean and predictor), and the LRMC rankings. I tracked over 1,200 college basketball games from February 1st until selection Sunday. For each game, I calculated the probability of the favorite winning (probabilities for Pomeroy came right from his site and probabilities for the other rankings were calculated using a regression model). Then I grouped the probabilities into groups (50% to 59%, 60% to 69%, and so on). Then I compared the difference between the predicted probability and the observed probability of each group. The graph below shows the results. The most accurate ranking systems will have small differences between the probabilities, so small bars are best. 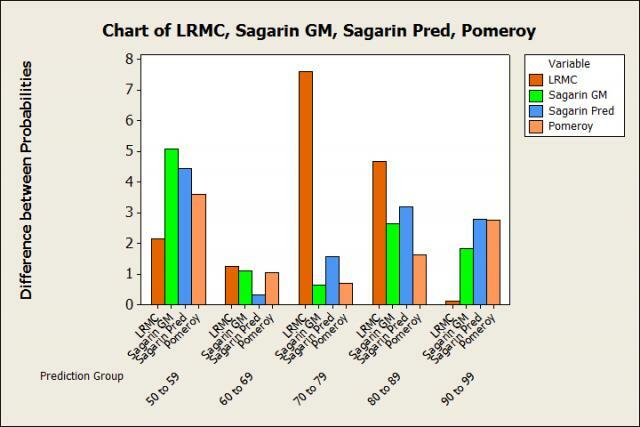 We can see the LRMC ratings have the largest difference in 3 different groups, including a 7.5% difference in the 70% to 79% group. So we won’t be using them! However, there isn’t a clear winner between the other three. If you add up all the differences, the Pomeroy ratings have the smallest total difference, although the two Sagarin systems aren’t very far behind. But here’s the thing, Ken Pomeroy did the same analysis I’m about to do using his ratings. So instead of duplicating his numbers here, I’m actually going to use the Sagarin Predictor rakings. They worked out pretty well last year (they had Louisville ranked as the #1 team). And along the way I’ll point out when the three rankings disagree on a team so you can choose which one to trust! Okay, enough with the boring talk, let’s get to the brackets! The table below indicates the probability each team in the South Region has of advancing in each round up to the Final Four. (Odds of winning the tournament have their own section at the bottom of this post.) The Rank indicates the team’s Sagarin Predictor rank and the number in parentheses indicates each team’s seed. Florida and Kansas are the clear favorites to win the South region. They are the only teams in the region ranked in the top 13 of the Sagarin rankings! However, keep in mind that the computers can’t account for injuries and Kansas will be without 7 foot center Joel Embiid for at least the first two games. Without him, Kansas is definitely not the 4th best team in the country, and if he’s out for more than the first weekend of the tournament, Kansas could be in trouble. In addition to the Embiid situation, Kansas is ranked lower in both the Golden Mean (5th) and Pomeroy (9th), whereas Florida is still 4th and 3rd respectively. So those systems would have Florida as an even heavier favorite. The safest pick here is to go with Florida, but even without Embiid Kansas is still a really good team, so no shame if you want to go with the Jayhawks. If you’re looking for a dark horse, the statistics like Ohio State. They’re a pretty big favorite in their first round game for a 6 seed, and both Sagarin rankings would actually favor the Buckeyes in a potential second round matchup against Syracuse (although Pomeroy would have them as slight underdogs). And their numbers would improve even more if they face a Embiid-less Kansas in the Sweet 16 (or if Kansas has already been knocked off by New Mexico or Stanford). UCLA has the 4th best shot, but they’ll be pretty big underdogs to Florida if they face them. But one quick point about their potential 2nd round game against VCU. VCU thrives when they are forcing turnovers (they’re #1 in the country in defensive turnover percentage), but UCLA ranks 16th in the country in offensive turnover percentage. So just like Michigan was in the NCAA tournament last year, UCLA appears to be a bad matchup for VCU. If you’re looking for 1st round upsets, this doesn’t appear to be the region for you. The 1 through 6 seeds all have at least about a 75% chance of winning. However, keep in mind that if you multiply all the probabilities together, the odds that they all win are only 32%. So chances are, at least one of them will lose. The question is which one will it be? Guess away! One final note, you’ll see that Pittsburgh is a pretty heavy favorite in the 8/9 game. Most people picking in your “just for fun” office pool will probably assume that game is a coin flip. So if want to gain edge (a very small one, but an edge nonetheless) go ahead and pick Pitt. The East is a much more open race than the South region. Villanova is the favorite to advance, but Virginia and Michigan St aren’t too far behind. And speaking of Michigan St, are you ready for some more injury talk? The Spartans had a plethora of injuries this season, with multiple key players missing time. The computers don’t know this, so the Spartans are probably underrated in all of the rankings. But keep in mind that underrated is still ranked 8th! (MSU is 9th in golden mean and 10th in Pomeroy, so they’re all pretty similar). Now, all of Michigan State’s players are healthy, and they looked very impressive in winning the Big 10 tournament. You could easily make the argument that if they were healthy all year, they’d be ranked higher than both Villanova and Virginia. So their probabilities in this table are too low (and their potential opponents' probabilities are too high). But how much higher Michigan State’s chances should be is very subjective and hard to quantify. But don’t just rule out Virginia yet, they’re still a very good team. With Cincinnati being a pretty weak 5 seed, and neither 8/9 seed being very good, it’s very likely that Michigan State and Virginia will meet in the Sweet Sixteen. That should be a great game, and you shouldn’t feel bad picking either team to win. In the bottom half of the bracket, Villanova gets the benefit of there not being any other great teams to go up against them. The only other team ranked in the top 20 is Iowa St (more on them in a second), and there is only a 50% chance they’ll even have to play them in the Sweet Sixteen! Although you’ll see that 7 seeded Connecticut is ranked higher than either the 6 seed or the 5 seed (also true in both golden mean and Pomeroy). They could present a tough 2nd round matchup for Villanova. If you want to pick some chaos in this region, you could do worse than Connecticut over Villanova. And also keep in mind that Villanova had some very good luck in close games (8-1 in 2 possession/OT games). And as the Big East tournament showed, that luck can run out at any time. Speaking of chaos, I want to talk about Iowa State for a minute. They are a heavy favorite over NC Central here, but the golden mean and Pomeroy rankings both have Iowa State ranked a lower and NC Central ranked higher. And over 3,750 Big 12 possessions, Iowa State had the same scoring differential as Texas and Kansas St (ranked 38th and 40th respectively in Sagarin Predictor). Don’t be surprised if NC Central keeps that game close, and you’d be wise to avoid putting Iowa State too far in your bracket. Every ranking system has outliers, and it just very may be that even at 15th, the Sagarin Predictor has Iowa State a little too high. Looking for a first round upset? Let me present to you Harvard over Cincinnati. Cincinnati will be the favorite, but this is definitely a winnable game for Harvard. And considering Michigan State would be a heavy favorite over Cincinnati in the next round anyway, you have very little to lose! Arizona has a big advantage in this region because they have very weak 4 and 5 seeds. In fact, they’re going to face a tougher team in their 2nd game than they will the Sweet 16! Both Gonzaga (8 seed) and Oklahoma St (9) are ranked higher than the 4 and 5 seeds! In fact, Oklahoma St has the 4th best chance of going to the Final Four…as a 9 seed! What is going on? Oklahoma State lost 12 games this season, but an amazing ten of them were by 2 possessions or less! And in one of the 2 blowout losses, they were without their best player, Marcus Smart. Overall Oklahoma State went 4-10 in 2 possession/OT games, making them much better than their record would indicate (they’re ranked 342 in Pomeroy’s luck statistic). Sagarin predictor has them at #10 and golden mean has them at #12. However, I should note that Pomeroy only has them at #22, so not all the computers agree that they are a top 12 team. The problem with taking Oklahoma State to go far is that Arizona is really good (plus don’t sleep on Gonzaga, Pomeroy actually has the Zags ranked higher than Oklahoma State). Arizona was #1 in all 3 rankings most of the season, but they fell to 2nd in both Sagarin rankings the last weekend of the season (they’re still #1 in Pomeroy). If you really want to get crazy, it’s not unthinkable to have Oklahoma State (or even Gonzaga) upsetting Arizona, but the safe play is to put Arizona to at least the regional finals. In the bottom half of the region, all the ranking systems agree that Creighton is a better team than Wisconsin (although by a slim margin). So Creighton has slightly better odds of advancing to the regional finals. But let’s focus on Wisconsin for a minute. They have only a 57.6% chance of making the Sweet Sixteen. That’s pretty low for a 2 seed. They face a better than you think opponent in American in the opening round. The Sagarin predictor gives American a 14% chance of pulling the upset. For reference, that’s about the same chance as Florida Gulf Coast had of beating Georgetown last year. And that probability only goes up if you use Pomeroy. He gives American an 18% chance of winning! If you want to pick a crazy upset (maybe you get bonus points in your pool for upsets), this is your best bet for a 2/15 upset. If Wisconsin beats American, they’ll most likely have to face a tough Oregon team. Oregon has to face BYU in the first round, but they have even a better chance of advancing than shown here. BYU had starting guard Kyle Collinsworth tear his ACL in BYU’s last game. The percentages above don’t account for that (and BYU is an underdog anyway) so avoid picking BYU in your bracket. Assuming they beat BYU, Oregon definitely has the ability to knock off Wisconsin in the 2nd round. In the land of first round upsets, that 12/5 games is coming up once again. North Dakota State has about a 1 in 3 chance of knocking off Oklahoma (same in all 3 ranking systems). And they’d have about the same chance of beating San Diego State in the next round too! That gives about a 1 in 9 chance that the name Taylor Braun will be very well known by the end of the weekend! This is going to be a fun one! Let’s start with the play in games. I’m using the numbers for Xavier and Cal Poly here since they are the higher ranked team. But for Iowa/Tennessee, I took their average ranking (Iowa is 13, Tennessee is 20 and I rounded up) and called that team Tennowa. Tennowa is a very dangerous team, but we’ll get to them later. Let’s start with the big one, Wichita State. The Sagarin ratings are not a fan, as they’re 11th in golden mean and 17th in predictor. Seventeenth! However, Pomeroy has them at #5. Obviously if you put them at #5, their odds become much better than what’s shown here and Louisville’s get worse. The truth is that it’s really hard to judge how good this team is. A case like Wichita State doesn’t happen often, so there is very little history to go off of. And the thing is, this tournament isn’t going to prove things one way or another either. An early loss doesn’t mean they were bad, and a deep run doesn’t prove that they’re great. It’s a single elimination tournament were crazy things happen. We do know that this Wichita State team is better than the one that went to the Final Four last year, but no matter which ranking system you use, their chances of doing that again are small. The main reason for those small chances is Louisville. Ranked #1 in both Sagarin rankings and #2 in Pomeroy, they’d be favored over Wichita no matter how you slice it. If you’re not a believer in the Shockers, Louisville is a no-brainer to advance to at least the regional finals. And to add to that, predictor rankings say Wichita would only be a 51% favorite over Kentucky if they met in the 2nd round. So picking Kentucky to reach the Sweet Sixteen wouldn’t be a bad selection. In the bottom half of the bracket, things could get crazy. Let’s start by pointing out that Tennowa is going to be very heavy favorites over Massachusetts. All three ranking systems agree you should avoid picking the Minutemen to advance. Meanwhile, Michigan is the weakest 2 seed in the field, but they lucked out in that the 15 seed is very weak (they can be glad it’s not American) and neither Texas or Arizona State are ranked very high. But still, Michigan is ranked so low that the winner of the 7/10 game will have a realistic shot of pulling the upset (about 1 in 3). As for Duke, they are the highest ranked 3 seed but they have a pretty tough road. Their opening matchup against Mercer isn’t a gimme (Mercer is in the 90s for both Predictor and Pomeroy but actually 73rd in golden mean). Then they’ll most likely have to face Tennowa, which could be a higher ranked team than any of the other top seeds have to face in the 2nd round. And if you think Iowa being ranked 13th is ridiculous, know that Tennessee is 13th in Pomeroy! Now both of those teams are likely outliers, and not really top-15 good. But they’re still much better than your average 11 seed. Either way, Duke fans should be rooting hard for Massachusetts in the opening round! As for first round upsets, I’ve already mentioned that you should take the 11 seed over Massachusetts. But you’d be inclined to take the 12 seed too (especially if it’s Xavier). Saint Louis is a very weak 5 seed no matter which ranking system you use, and they will definitely be on upset alert early on. And one more thing before we move on the Final Four. Assuming they win the play in game on Wednesday, look at Cal Poly’s chances of advancing to the 2nd round. They’re about 11%. For a 16 seed, that’s about as good as you’re going to get. Now keep in mind this assumes Wichita State is the 17th best team, so if you believe they are better than that ignore this paragraph. But if they’re not, Poly would have a realistic shot at becoming the first ever 16 seed to beat a 1 seed. Friday night at 7 p.m. Make sure to keep an eye on it! Louisville is the #1 ranked team in the Sagarin Predictor, so it follows that they have the best probability of winning the entire thing. But don’t think of this as a prediction that they will win. In fact, this is saying that there is a 75% chance that they won’t win. If you think the computers are overestimating Louisville (or if you just want to pick somebody else), Arizona and Florida are fine choices. And keep in mind that Pomeroy still has Arizona ranked #1 (although Louisville isn’t far behind at #2). Plus Michigan State has a better chance than the numbers here indicate. One last point I’d like to make is that everybody loves to complain about teams being under- or over-seeded. But look how the probability of each team winning the tournament almost lines up perfectly with their ranking in the Sagarin predictor. The best teams have the best odds, regardless of the seed. Louisville doesn’t suffer at all from being a 4 seed (in fact, the committee probably did them a favor putting them in a region with Wichita as the 1 and Michigan as the 2). Even Oklahoma State and Ohio State aren’t hurt too much by being a 9 and 6 seed! And remember, in a single game, the best team doesn’t always win. If we could predict this entire thing perfectly with mathematics, it would be really boring and Warren Buffet wouldn’t be offering a billion dollars for a perfect bracket. So use the statistics as a guide, but have some fun with it too. So sit back, relax (though I'm not sure if that's possible during the tournament), and enjoy the madness!